From the minute I started reading this book, I was hooked. I could not put it down. And I've been telling everyone about it since I finished it. Divergent is a dystopian novel. As a way to control the outbreaks of war, the government built five factions. The five factions include: Candor (the honest), Abnegation (the selfless), Dauntless (the brave), Amity (the peaceful), and Erudite (the intelligent). On a certain day every year, all sixteen-year-olds must choose which faction they want to live in for the rest of their lives. 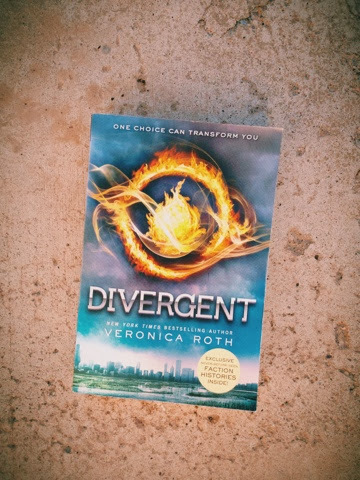 The story follows Beatrice Prior as she faces the actions of her choice. Veronica Roth does an amazing job with this book. She writes in short, quick sentences that captures the excitement of the story. It's so easy to get lost in the pages, waiting to see what comes next. I highly recommend this book. Previous Post now a barista. Next Post getting back to normal.